Deer in Moonlight Mural - Rosewood Colorway 16" x 16"
Use large patterns for large spaces. Large patterns that require eight, sixteen, or more tiles to create the pattern should be reserved for large areas. For instance, the chevron pattern in this Cuban Heritage 260-1A Pattern covers about 24" across by 16" wide. The size of the pattern dictates the tile should be used in a sizable area. See other great ways to use decorative tile from The Decor Girl's recent post about Let Tile Lead Your Interior Design. Interior Designer, Lisa Smith, has a great blog, Decor Girl, with all kinds of useful design tips! Deer in Moonlight Mural - 16" x 40"
We have a special holiday gift just for you. Receive 10% off all online tile purchases when you spend $100 or more. Just place your order online by December 31, 2011. Use coupon code MERRY during checkout. We still have some unpolished Cathedral 8" x 8" cement tile ready to ship from the factory. While supplies last the Cathedral tile is available at a special price of $5.12 per tile. No other discounts or coupons can be applied. Colors used in this pattern include Powder Blue, Pearl Gray, Amber White and custom brown colors. This is a great choice when you need a unique look but can't wait for a custom order. Call 888.739.4972 (9-5 PDT M-F) and place your order today. Call us with your dimensional area requirements and we'll provide a FREE estimate that includes freight and handling. I love tile for its ability to transform a home. Tile can add depth, a splash of color or visual interest with its pattern. The enormous variety of tile also allows you to create your own, unique expression in your space. Whether it is cement tile in your foyer, a mural for your backsplash and hearth, or a hand painted ceramic tile tile in a bathroom - let tile transform your space all year. I thank all of our customers and friends who have contributed to our success this past year. And, we look forward to helping new customers find unique, artisan tile that will transform their home or commercial space into something truly magical that is enjoyed all year by friends and family. Best wishes from Avente Tile. We have a special holiday gift just for you. Receive 10% off all online tile purchases when you spend $100 or more. Just place your order online before December 31, 2011. Use coupon code MERRY during checkout. Having trouble finding the right holiday gift for that special someone? What something unique and unusual? Have you considered hand painted tile? Our selections of hand painted tiles make unusual and distinctive gifts. Each tile is a miniature work of art touched by the hand of an artisan. In fact, some of our customers have even framed our tiles! Here’s three way to use our tiles for a thoughtful holiday gift. Make sure to call and verify stock before you order because we have limited quantities of these hand painted tiles on hand. Tile Art: Bird Over Wave 8" x 8"
1. Bird and Nest Tiles are great wall plaques for a kitchen or bath. They are also great garden art. Our Bird and Nest Tiles have beautiful pooled glazes and intricate relief designs. They come in 8”x8” and 8”x10” format and have a built-in niche for easy hanging! These richly colored tiles are a collage of nature inspired images, from birds to plants, and ocean waves to the night sky. Bird and Nest Tiles create a soothing space in your home. 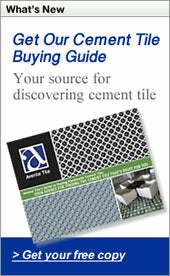 Save 15% on all Bird and Nest tiles through January 31, 2012. No coupon necessary, just place your order online! Tile Art: Bird with Stars 8" x 10"
2. Create a trivet from any of our 6”x6” tiles. Just add felt or cork protectors to the back of each tile. Choose from our Spanish (matte Finish), Portuguese (gloss finish), or Barcelona (Satin Finish) lines. Remember these tiles have unglazed edges. 3. Create a coaster set using our 4”x4” tiles. Choose from our Spanish and Portuguese lines. Mix or match from several designs in each line and create a coaster set with 4"x4" tiles. You can coordinate with the trivet tiles for a special gift as well. You’ll need to add felt or cork protectors to the back of each tile. Remember these tiles have unglazed edges. Our hand painted tiles are works of art and make a wonderful and unique gift. If you have questions about the tiles, just let us know. And for you last minute shoppers, we can expedite shipping for any item in stock to make sure it arrives quickly. Just call us and we can quote different shipping options to meet your budget and delivery schedule. Happy holiday shopping! We’ve been talking a lot about tile and fireplaces this fall. In October, we showed you Four Fireplace Tile Design Ideas using hand painted tiles. In November, we showed you a few Cement Tile Fireplace Ideas. This week we share a customer’s photos using our hand painted Spanish Albacete tiles. First, we want to thanks Heidi Halderman of Natural Stone Design Gallery in Sacramento who worked with us and her customers to create a stunning look. We are SO happy with the fireplace!! Thank you so much, Heidi. Your creativity is now in almost every room of the house! What I love about this design is how well it works with the other surfaces and material in the room. The decorative tiles really add a splash of color to the room. They are right at home with the terra cotta floor pavers, stone molding and black granite mantle and bench. The design uses our Spanish Albacete 6"x6" on the front of the fireplace and Spanish Albacete 3"x6" on the sides. With hand painted tiles it’s a good idea to ask for samples that show the range of colors. Or, at least what’s currently available. Having a few samples with the most variation helps you understand the variation that you can expect to see in hand painted tiles. And, that's exactly what Heidi did. She ordered several samples. Discussed her concerns with the variation. When she was ready to order, she let us know that she needed tiles with saturated colors for the project to work. Many folks love the lighter tones; some folks want the darker ones. Our goal at Avente Tile is to provide all of the tiles for a project in a consistent dye lot that the customer prefers. If not, we let you know what’s available before we ship your order. Again, we want to thank Heidi at Natural Stone Design Gallery in Sacramento for choosing to work with Avente on this project. Natural Stone Design Gallery has been a partner with Avente since 2009 and feature many of our hand painted tiles in their showroom. If you are in Sacramento, stop by and say hello!